1. As Planning Commission Chair in my city, I lead twice monthly, televised meetings which include specific protocol, a process of citizen testimony, & decision making by a nine-member appointed commission. 2. Over the past three years, I have presented 14 times at various national & state conferences. 3. As a member of the HOD Culture Team, I am actively involved in enhancing the effectiveness of the HOD & have lead an assessment of delegate values around the mega issue process. Delegate Food & Culinary Professionals DPG 2016 - 2019 1. Selected as the Co-Chair of HOD Designer Team, which will work to define a new process for governance within the House of Delegates. 2. Appointed to the Culture Team by HOD Leadership. In this role, I have been actively involved with ensuring a HOD culture that supports effective engagement on topics related to advancing our professional practice. 2. Submitted a Mega Issue titled "Leveraging Big Data & Artificial Intelligence in Dietetics Practice." 1. Launched an Agriculture Subgroup, establishing the RD dialogue from seed to table. 2. Pilot tested a U.S. culinary experience, increasing the opportunity for all members to strengthen their food knowledge. 3. Launched two Academy of Nutrition and Dietetics Certificates of Training, one on culinary skills and one on careers in retail dietetics. Practice Paper Author Academy of Nutrition & Dietetics 2016 - 2014 While originally volunteered as a reviewer, became an author of the "Selecting Nutrient-Dense Foods for Good Health" practice paper published in September of 2016. Supermarket Subgroup Chair Food & Culinary Professionals DPG 2011 - 2013 In this role, I ensured that the needs of retail dietitian members were met through education and networking as well as management of the electronic mailing list discussions within this targeted audience. Secretary Dietitians in Business and Communications DPG 2008 - 2009 I ensured accurate documentation of key Executive Committee decisions and actions and participated as a voting member of the Executive Committee. A key opportunity for the future of the nutrition profession is thriving amidst constant change. Artificial intelligence, technology, & realities of how consumers want to access health care are evolving nutrition, health & wellbeing. This is compounded by the shift to Millennial & Generation Z’s demands. These evolving culture shifts require dietetic professionals to be flexible in leveraging multiple skill sets, establish & use strong leadership skills, & be futuristic in their approaches. 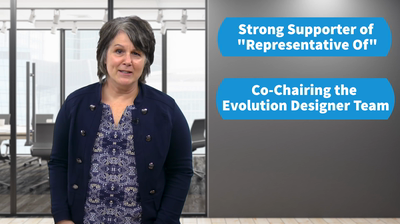 3 reasons to VOTE for me: I will REPRESENT the VOICE of Academy MEMBERS, IMPROVE HOD PROCESS and outcomes, & bring THOUGHT DIVERSITY to the HOD Leadership Team. Annette Maggi for HOD Director.